This edition of The Rule of St. Benedict comes complete with a Touch-or-Click Table of Contents.The Rule of Saint Benedict (Regula Benedicti) is a book of precepts written by St. Benedict of Nursia for monks living communally under the authority of an abbot. Since about the 7th century it has also been adopted by communities of women. 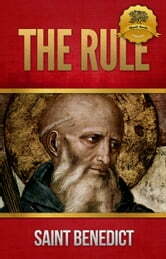 During the 1500 years of its existence, it has become the leading guide in Western Christianity for monastic living in community.The spirit of St Benedict's Rule is summed up in the motto of the Benedictine Confederation: pax ("peace") and the traditional ora et labora ("pray and work").Compared to other precepts, the Rule provides a moderate path between individual zeal and formulaic institutionalism; because of this middle ground it has been widely popular. Benedict's concerns were the needs of monks in a community environment: namely, to establish due order, to foster an understanding of the relational nature of human beings, and to provide a spiritual father to support and strengthen the individual's ascetic effort and the spiritual growth that is required for the fulfillment of the human vocation, theosis.